A 2’40” opera with video animation by Dimitris Fotiou and text by Maria Tranou. Soprano, Katrina Mena. Piano, JC Espinosa. The piece was born out of a conversation between Fotiou and Espinosa at an artists’ residency program in the Drenthe province of the Netherlands in 2009. The collaborative process took place mostly over Skype, with Tranou joining the process later with her stunning text about a nomadic alien civilization looking for a home somewhere in space. The entire story was condensed into just under three minutes. Miami, 2010. Original music by Juan Carlos Espinosa, Nicolas Johnson, actor. As the Arctic sea ice melts, nations clamor to raise their flags over newly open waters to claim the natural resources that lie beneath them – oil, manganese, diamonds, fish – and to control shipping lanes. Meanwhile, rising sea levels threaten the world below. 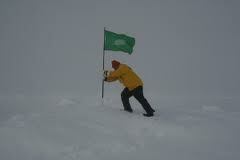 On June 29th, 2008, Miami artist Xavier Cortada arrived at the North Pole and planted a green flag to “reclaim it for nature.” Camera and music, Juan Carlos Espinosa, Directing and editing, Xavier Cortada. Ninnus, one of seven pieces by Espinosa titled Ice Paintings. It is used as the score in this short film on the making of Xavier Cortada’s Ice Paintings Series made by the Peabody-Essex Museum in Salem, MA in 2008. Infecundas” is a short film by Miami artist Xavier Cortada with music by Juan Carlos Espinosa. The piece was filmed in 2007 at a US Department of Agriculture facility in Bradenton, Florida where the government prepares for the release of millions of Mediterranean fruit flies that have been made sterile by irradiation. Cortada captures the ritualistic rhythms of the USDA workers who gather the radioactive flies; they work in a freezer to keep the flies from escaping. The flies will soon be released from a crop duster plane and “mate” with a female who will lay infertile eggs. Espinosa’s mesmerizing score sways with the motion of the process: Getting flats with thousands of flies to vacuum suction tube to canister to the air to your citrus trees to your breakfast table. “Erebus” is a composition for trombone, piano and electronics. The piece uses fragments of recordings of the sounds of earthquakes and ice quakes at Antarctica’s volcano Mount Erebus. The original sounds are inaudible to humans and are sped up by volcano experts from the New Mexico Institute of Mining and Technology. Shown here is the middle section of the three-part work. The film was created by Bill Bilowit. Erebus was premiered at the Subtropics Music Festival in 2007.